Ntr and NavyaReddy’s relationship is more than just Sun sign compatibility of Taurus and Sagittarius. No individual is a pure Taurus or Sagittarius but instead is a unique combination of signs and planets. The following interpretation defines the synastry or interplanetary aspects between the planets in NavyaReddy’s birth chart and the planets in Ntr’s birth chart. There is no evil planet in the combinations. No single combination can make or break the relationship. The list goes from the most harmonious (positive) to the most discordant (negative). Ntr’s Jupiter Sextiles NavyaReddy’s Uranus (+9.79 harmony) – Ntr’s sense of growth, expansion, or generosity combines pleasantly with NavyaReddy’s sense of independence, freedom, and originality. Ntr’s visions stimulate NavyaReddy’s creative genius. Ntr will expand NavyaReddy’s goals and creativity. NavyaReddy adds innovation and excitement to Ntr’s projects. Freedom and self-expression are the primary focus of the relationship. NavyaReddy’s Venus Trines Ntr’s Mars (+9.40 harmony) – NavyaReddy’s sense of sexuality, attraction, or intimacy combines very effortlessly with Ntr’s sexual drive, temper, and powers of self-assertion. There is harmony in the desire of Ntr and loving nature of NavyaReddy. Both are strongly attracted to each other. This aspect is favorable in marriage and offers a fulfilling relationship. NavyaReddy’s Venus Sextiles Ntr’s Jupiter (+8.80 harmony) – NavyaReddy’s sense of sexuality, attraction, or intimacy combines pleasantly with Ntr’s spirit of growth, expansion, or generosity. Both enjoy the same pastimes, cultural activities, and other forms of entertainment. There is natural stimulation in the relationship that brings out good qualities like optimism and self-confidence in each other. Ntr’s Sun Trines NavyaReddy’s Neptune (+7.62 harmony) – Ntr’s sense of identity, ego, will, and character combine very effortlessly with NavyaReddy’s sense of spirituality, imagination, or mystical inclination. There is harmony in the abundance of warmth and artistic creativity in the relationship. Sharing of dreams with a sense of freedom is normal between NavyaReddy and Ntr. Both share an interest in performing arts and metaphysical matters. Ntr’s Sun Trines NavyaReddy’s Venus (+7.40 harmony) – Ntr’s sense of identity, ego, will, and character combine very effortlessly with NavyaReddy’s understanding of sexuality, attraction, or intimacy. There are wealth and material bond between NavyaReddy and Ntr. NavyaReddy’s power of attraction is in harmony with Ntr’s confidence and abilities. There is a strong romantic and magnetic attraction with each other. The relationship offers financial security and generosity in sharing everything with one another. NavyaReddy’s Uranus Sextiles Ntr’s Uranus (+6.07 harmony) – The individual sense of independence, freedom, and originality combine pleasantly with the couple. NavyaReddy and Ntr stimulate each other’s strange ideas. There is a feeling of openness. Both enjoy their own craziness. The relationship encourages one another to have a broader view of the changes affecting society in general. NavyaReddy’s Moon Sextiles Ntr’s Venus (+6.00 harmony) – NavyaReddy’s emotional needs combine pleasantly with Ntr’s sense of sexuality, attraction, or intimacy. The relationship stimulates deep mutual devotion and affection in each other. Both tend to be liberal on financial matters. NavyaReddy and Ntr have common interests in many things including social activities. There is a strong attraction for love and marriage between NavyaReddy and Ntr. Ntr’s Jupiter Conjuncts NavyaReddy’s Pluto (+5.68 harmony) – Ntr’s sense of growth, expansion, or generosity combines with NavyaReddy’s sense of transformation, change, or power and destiny. NavyaReddy can be possessive and domineering. Ntr will inspire and encourage NavyaReddy. The combination can either be in harmony or discord depending on other aspects. This aspect helps deepen the connection between Ntr and NavyaReddy. NavyaReddy’s Sun Sextiles Ntr’s Pluto (+4.67 harmony) – NavyaReddy’s sense of identity, ego, will, and character combine pleasantly with Ntr’s sense of transformation, change, or power and destiny. The relationship stimulates growth through unity and involves a lot of alterations. They are active in exploring each other’s deepest fears, desires, and motives. There is mutual enjoyment in exchanging ideas and solving mysteries together. NavyaReddy can bring out the psychoanalyst in Ntr. Ntr’s Mars Trines NavyaReddy’s Uranus (+4.51 harmony) – Ntr’s sexual drive, temper, and powers of self-assertion combine very effortlessly with NavyaReddy’s sense of independence, freedom, and originality. There is harmony in stimulating a productive sense of adventure. Both encourage confidence, aggressive drive, and initiative in each other. NavyaReddy’s Moon Trines Ntr’s Mercury (+4.13 harmony) – NavyaReddy’s emotional needs combine very effortlessly with Ntr’s mentality and powers of perception. There is harmony in the intuitive knowledge of each other’s ideas and views. The relationship facilitates good communication and understanding. Both have many similar interests and encourage each other’s mental development. Ntr and NavyaReddy are often in complete agreement with each other. Sometimes they can interpret each other’s dreams. Ntr’s Mars Trines NavyaReddy’s Neptune (+4.11 harmony) – Ntr’s sexual drive, temper, and powers of self-assertion combine very effortlessly with NavyaReddy’s sense of spirituality, imagination, or mystical inclination. There is harmony in the equal exchange of sympathy and compassion. Ntr helps NavyaReddy fight procrastination. NavyaReddy inspires Ntr to more significant achievements. NavyaReddy’s Mars Sextiles Ntr’s Jupiter (+4.04 harmony) – NavyaReddy’s sexual drive, temper, and powers of self-assertion combine pleasantly with Ntr’s sense of growth, expansion, or generosity. The relationship stimulates mutual helpfulness in achieving prosperity. NavyaReddy provides a foundation for aggressive action for Ntr’s dreams of development. This aspect is also favorable in business partnerships. Ntr’s Sun Trines NavyaReddy’s Mars (+3.88 harmony) – Ntr’s sense of identity, ego, will, and character combine very effortlessly with NavyaReddy’s sexual drive, temper, and powers of self-assertion. Ntr and NavyaReddy are in harmonious agreement in achieving mutual goals or meeting challenges together. The partnership creates a powerful sense of ambition, energy, and enthusiasm in each individual. Both NavyaReddy and Ntr inspire creative passion in one another. Ntr’s Jupiter Trines NavyaReddy’s Saturn (+3.45 harmony) – Ntr’s sense of growth, expansion, or generosity combines very effortlessly with NavyaReddy’s sense of commitment, necessity, or duty. NavyaReddy’s practicality is in harmony with Ntr’s expansive ideas. Ntr provides vision while NavyaReddy creates structure. Both work better as a team to achieve significant goals. This aspect is also favorable in a business partnership. NavyaReddy’s Venus Sextiles Ntr’s Uranus (+3.35 harmony) – NavyaReddy’s sense of sexuality, attraction, or intimacy combines pleasantly with Ntr’s sense of independence, freedom, and originality. There is stimulation that brings out the latent creative genius in each other. A mystical or glamorous aura is present in the relationship. Ntr surprises NavyaReddy in one way or another. NavyaReddy has a pleasant way of toning down Ntr’s eccentricity. NavyaReddy’s Sun Sextiles Ntr’s Saturn (+2.78 harmony) – NavyaReddy’s sense of identity, ego, will, and character combine pleasantly with Ntr’s sense of commitment, necessity, or duty. NavyaReddy and Ntr can stimulate each other to work towards their common goals. There is a sense of practicality in the relationship. NavyaReddy and Ntr can agree on how to handle their problems. Both know how to allocate duties and responsibilities. NavyaReddy’s Saturn Trines Ntr’s Uranus (+1.96 harmony) – NavyaReddy’s sense of commitment, necessity, or duty combines very effortlessly with Ntr’s sense of independence, freedom, and originality. NavyaReddy’s practicality and groundedness are in harmony with Ntr’s genius and inspirations. The relationship unites new ideas of Ntr with the experience and caution of NavyaReddy toward a constructive goal. Ntr is spontaneous and creative while NavyaReddy is sensible and levelheaded. Ntr’s Sun Trines NavyaReddy’s Uranus (+0.39 harmony) – Ntr’s sense of identity, ego, will, and character combine very effortlessly with NavyaReddy’s sense of independence, freedom, and originality. NavyaReddy’s unusual nature blends harmoniously well with Ntr’s highly creative life. The relationship stimulates each other’s innovation and exchange of progressive ideas. There is a smooth flow of encouragement and individualism between Ntr and NavyaReddy. NavyaReddy’s Mercury Conjuncts Ntr’s Neptune (neutral) – NavyaReddy’s mentality and powers of perception combine with Ntr’s sense of spirituality, imagination, or mystical inclination. Ntr brings out the poet and dreamer in NavyaReddy. There is a robust telepathic connection between NavyaReddy and Ntr that helps to understand each other without speaking a word. Sometimes NavyaReddy can win arguments even when it’s wrong. NavyaReddy’s Moon Conjuncts Ntr’s Moon (neutral) – The couple’s individual emotional needs combine with ease. NavyaReddy will be sensitive to Ntr’s moods or feelings, and vice versa. The fusion of sympathy and understanding makes both agree on almost anything under the sun. NavyaReddy and Ntr have many traits in common including likes, dislikes, and viewpoints. The emotional compatibility promotes a long-lasting relationship. Ntr’s Uranus Conjuncts NavyaReddy’s Pluto (neutral) – Ntr’s sense of independence, freedom, and originality may combine or resist with NavyaReddy’s sense of transformation, change, or power and destiny. The intensity will depend on other factors of the relationship. This is favorable if Ntr and NavyaReddy have more aspects in harmony than in discord. NavyaReddy’s Sun Conjuncts Ntr’s Neptune (neutral) – NavyaReddy’s sense of identity, ego, will, and character combine with Ntr’s sense of spirituality, imagination, or mystical inclination. The spiritual tie between Ntr and NavyaReddy is deep and unbreakable. The fusion of understanding, romance, dedication, sympathy, idealism, and personal sacrifice in the relationship is remarkable. Both can read each other’s mind frequently. NavyaReddy may find Ntr hard to comprehend or elusive in some way. NavyaReddy’s Mars Sextiles Ntr’s Uranus (-0.53 discord) – NavyaReddy’s sexual drive, temper, and powers of self-assertion combine pleasantly with Ntr’s sense of independence, freedom, and originality. The relationship stimulates confidence in each other. Both will benefit from a sense of adventure and creativity as a team. Ntr’s Saturn Squares NavyaReddy’s Uranus (-0.84 discord) – Ntr’s sense of commitment, necessity, or duty interacts stressfully with NavyaReddy’s sense of independence, freedom, and originality. There is friction in the conservative principles of Ntr and the progressive nature of NavyaReddy. Ntr will restrict NavyaReddy’s progress and expression of individuality. NavyaReddy will rebel against the traditional and controlling character of Ntr. NavyaReddy’s Mars Trines Ntr’s Mars (-1.35 discord) – The individual sexual drive, temper, and powers of self-assertion combine very comfortably between the couple. There is harmony in the desires and dreams of NavyaReddy and Ntr. The relationship is encouraging to achieve each other’s goals and ambitions. Ntr and NavyaReddy are incredibly attracted to each other and are sexually compatible. Ntr’s Moon Squares NavyaReddy’s Mercury (-1.54 discord) – Ntr’s emotional needs interact stressfully with NavyaReddy’s mentality and powers of perception. There is friction in the mismatch of tastes and interests. Ntr is hypersensitive and tend to misinterpret NavyaReddy’s intentions. NavyaReddy pays no attention or ignores the sensitive nature of Ntr. Arguments and debates are common in the relationship. NavyaReddy’s Venus Squares Ntr’s Pluto (-1.62 discord) – NavyaReddy’s sense of sexuality, attraction, or intimacy interacts stressfully with Ntr’s sense of transformation, change, or power and destiny. There is an intense and sometimes uncomfortable sexual attraction in the relationship. There is friction in dealing with issues of jealousy, possessiveness, and volatile emotions. The association may breed anger and even hatred of one another. NavyaReddy’s Moon Squares Ntr’s Jupiter (-1.77 discord) – NavyaReddy’s emotional needs interact stressfully with Ntr’s sense of growth, expansion, or generosity. It’s common to have disagreements about religion, finances, and family matters. The friction between NavyaReddy and Ntr is not enough to create serious difficulty in the relationship. NavyaReddy may feel uncomfortable when Ntr misunderstands a passing mood. Ntr may make extravagant pledges making NavyaReddy to expect too much and be disappointed when the promises are broken. Ntr’s Mercury Squares NavyaReddy’s Jupiter (-2.60 discord) – Ntr’s mentality and powers of perception interact stressfully with NavyaReddy’s sense of growth, expansion, or generosity. There is friction in the exchange of ideas in the relationship. Ntr will seem petty to NavyaReddy. NavyaReddy might promise more than can be delivered. This is not a serious conflict if there are many harmonious aspects to the relationship. Ntr’s Sun Opposes NavyaReddy’s Pluto (-3.56 discord) – Ntr’s sense of identity, ego, will, and character confront and challenge NavyaReddy’s sense of transformation, change, or power and destiny. There is tension in the random testing of loyalty and tolerance in the relationship. NavyaReddy will be rebellious, demanding, and even revengeful when responding to the authority of Ntr. Both have a competitive personality that can cause damage to the relationship. NavyaReddy’s Moon Squares Ntr’s Uranus (-4.00 discord) – NavyaReddy’s emotional needs interact stressfully with Ntr’s sense of independence, freedom, and originality. The friction can arouse irritations between Ntr and NavyaReddy. Ntr is eccentric, inconsiderate, and unpredictable. NavyaReddy is hypersensitive and moody. Any romantic attraction can lead to an unusual relationship that may not last long unless other aspects stabilize the connection. NavyaReddy’s Mars Squares Ntr’s Pluto (-4.46 discord) – NavyaReddy’s sexual drive, temper, and powers of self-assertion interact stressfully with Ntr’s sense of transformation, change, or power and destiny. There is friction in each other’s resistance to display of authority by the other. Both can be vindictive toward each other. There is a power struggle for dominance in the relationship. NavyaReddy’s Venus Squares Ntr’s Saturn (-4.93 discord) – NavyaReddy’s sense of sexuality, attraction, or intimacy interacts stressfully with Ntr’s sense of commitment, necessity, or duty. There is friction in the controlling nature of Ntr and the affectionate nature of NavyaReddy. NavyaReddy feels dominated. Ntr tends to impose too much responsibility on NavyaReddy. 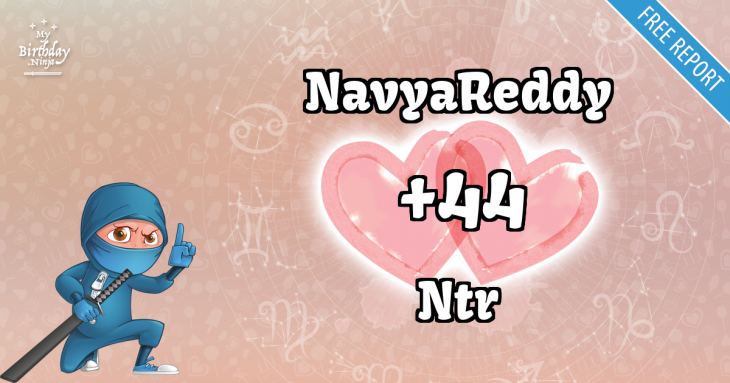 NavyaReddy’s Neptune Squares Ntr’s Pluto (-6.77 discord) – NavyaReddy’s mystical or spiritual inclination interacts stressfully with Ntr’s sense of transformation, change, or power and destiny. There is friction in the religious or philosophical beliefs of NavyaReddy and Ntr. Ntr will likely have a more forceful personality that NavyaReddy. NavyaReddy attempts to give Ntr spiritual advice about the personal or psychological journey. Ntr in return will psychoanalyze NavyaReddy’s religious or philosophical beliefs. Ntr’s Moon Squares NavyaReddy’s Pluto (-7.57 discord) – Ntr’s emotional needs interact stressfully with NavyaReddy’s sense of transformation, change, or power and destiny. There is friction in Ntr’s defensive nature and NavyaReddy’s nastiness. NavyaReddy expects Ntr to make all the adjustments creating deep antipathy instead of agreement in the relationship. There could be severe family issues and misunderstandings in marriage. NavyaReddy’s Mars Squares Ntr’s Saturn (-9.36 discord) – NavyaReddy’s sexual drive, temper, and powers of self-assertion interact stressfully with Ntr’s sense of commitment, necessity, or duty. There is friction in Ntr’s constructive ideas and NavyaReddy’s enthusiasm. Ntr may have unreasonable demands for NavyaReddy. This makes NavyaReddy impatient, angry, and defiant. The relationship has many problems of adjustment. Ntr’s Mars Opposes NavyaReddy’s Pluto (-10.24 discord) – Ntr’s sexual drive, temper, and powers of self-assertion confront and challenge NavyaReddy’s sense of transformation, change, or power and destiny. There is tension in each other’s resistance to display of authority by the other. Both can be vindictive toward each other. There is intense competition in the relationship. Ntr’s Venus Squares NavyaReddy’s Saturn (-10.89 discord) – Ntr’s sense of sexuality, attraction, or intimacy interacts stressfully with NavyaReddy’s sense of commitment, necessity, or duty. There is friction in the controlling nature of NavyaReddy and the affectionate nature of Ntr. Ntr feels dominated. NavyaReddy tends to impose too much responsibility on Ntr. Ntr’s Saturn Squares NavyaReddy’s Neptune (-11.18 discord) – Ntr’s sense of commitment, necessity, or duty interacts stressfully with NavyaReddy’s sense of spirituality, imagination, or mystical inclination. There is friction in Ntr’s realism and NavyaReddy’s idealism. There are 4 mutual receptions in NavyaReddy and Ntr’s planet combinations. Planets in mutual reception enhance each other. This will add +40 harmony to the total score. The remaining -10.82 discord is due to some minor aspects or planets in parallel. This is only a quick assessment of the relationship compatibility between NavyaReddy and Ntr. If both place and time of births are known, an in-depth interpretation is available in the Star Lovers Report. Try a free sample with no obligation to buy. Ssshhh! NavyaReddy, don’t let Ntr know. You are most compatible with a person born on February 11, 2001. You have a whooping birthday love match score of +154 with that person. Check it out and imagine what it feels like to be with your soul mate.